On Saturday 13 June 1908, the newly-formed Cardiff and District Women’s Suffrage Society were returning from a mass demonstration in London to demand equal voting rights. On the journey back to Cardiff, their coach was intercepted by police. The vehicle was searched, and all propaganda material was confiscated and set alight in a nearby field. One item escaped the fire – a large canvas banner, featuring a hand-stitched red dragon motif and the Society’s name. One of the suffragists, Irene Protheroe, concealed the item from police in her clothing, and brought it back to Cardiff in one piece. Special Collections and Archives was recently contacted by Irene’s granddaughter, now living in London. She told us that a women’s suffrage banner had been passed down through her family. She knew that it had been taken to London and back for a march, and saved from destruction, but had no more specific details. 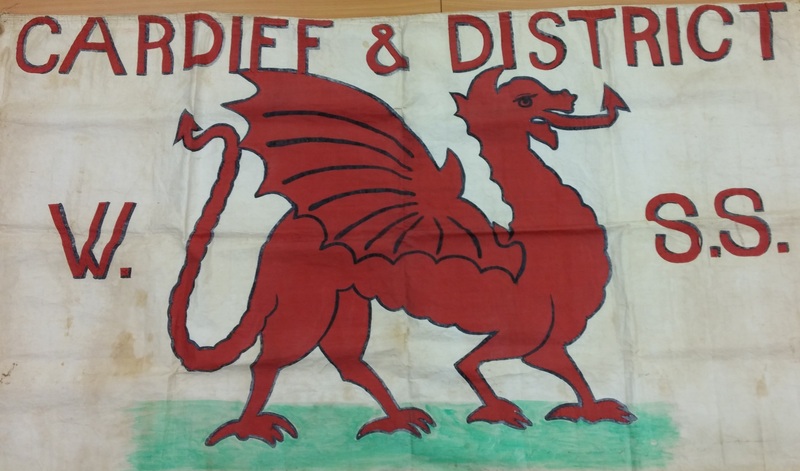 Seeking a safe home for its long-term preservation, Irene made a final London-to-Cardiff trip with the banner, and kindly agreed to donate this very special piece of Cardiff’s history to the archives. Seeking further information on the march mentioned by the donor, we enlisted the help of Beth Jenkins, PhD candidate in the School of History, Archaeology and Religion. Her research examines women’s professional employment in 19th and 20th century Wales. 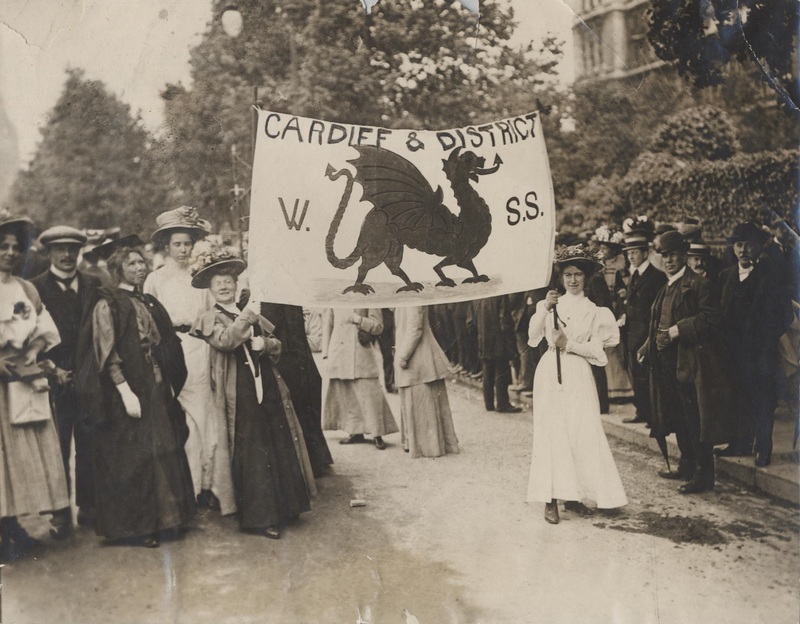 She immediately recognised the banner from photographs of the 1908 march, which have been reproduced here with the kind permission of Local Studies, Cardiff Public Library. Below, Beth summarises her research on the details of the march and its wider context. In June 1908, over 10,000 women marched from Embankment to the Royal Albert Hall, where a large meeting took place. The procession was organised by the ‘constitutional’ wing of the women’s suffrage movement and led by Millicent Fawcett, leader of the National Union of Women’s Suffrage Societies. It included women from all classes, parties, and areas of Britain. Provincial detachments marched behind the leaders in alphabetical order. Each contingent carried a banner made for the march by local branch members, or designed by the Artists’ League for Women’s Suffrage. These banners used regional or national emblems: a leek for Llandudno and a dragon for Cardiff. The years preceding the First World War were the pinnacle of activity in the struggle for women’s parliamentary franchise, and campaigners used both constitutional and militant means to promote their cause. Banners were an important element of the spectacle in the suffrage marches and helped to distinguish groups – even though contemporaries did not always do so. The participants of this march displayed their non-militancy in the colours they wore: the red, white and green of the National Union of Women’s Suffrage Societies, rather than the purple, white and green which would be used by the Women’s Social and Political Union in their Hyde Park rally the following week. Participants with degrees also wore their academic robes to demonstrate the respectability of their supporters and women’s suitability for citizenship. Formed in June 1908, this march would have been one of the Cardiff and District Women’s Suffrage Society’s inaugural activities. The society began with a membership of 70, and rapidly grew until it became the largest branch outside of London in 1912-13. Its membership peaked at 1,200 on the outbreak of the First World War. The branch’s co-founder was Millicent Mackenzie, Professor of Education at the University (formerly the University College of South Wales and Monmouthshire). Mackenzie became the first female professor in Wales and the first female professor in the United Kingdom appointed to a fully chartered university in 1910. She also stood as the only female parliamentary candidate in Wales in 1918 – the first election in which women could vote, and be voted for. Following the Representation of the People Act in 1918, the Cardiff and District Women’s Suffrage Society reconstituted itself as a Women Citizens’ Association, and continued to campaign for women’s franchise on the same terms as men. This was eventually achieved in 1928. 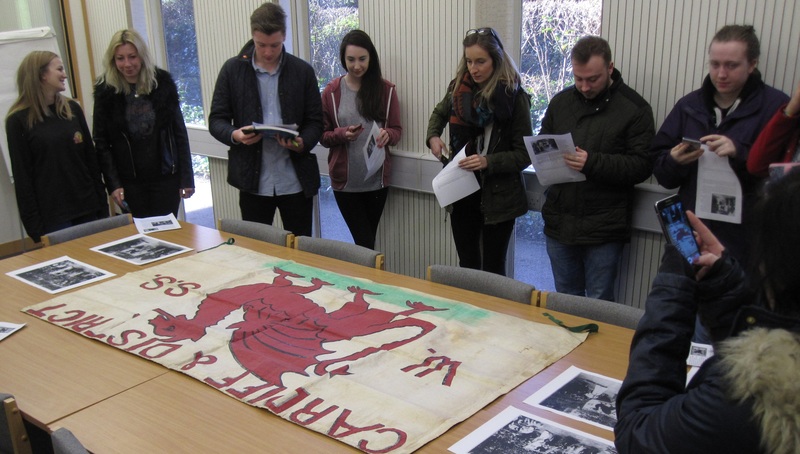 Back in the School of History, Archaeology and Religion, Professor Bill Jones brought his Culture, Society and Identity in Wales 1847-1914 undergraduates into Special Collections to see the banner. The impact was palpable: following a stunned silence, the group broke out into discussion: how was it made, who would have carried it, what did they talk about while it was being sewn, how far through the sewing were they before they realised that the dragon was facing the wrong way…? Some questions will never be answered, but thanks to the University’s research community, we now know much more about the history of this important item. This entry was posted in Alison Harvey, News and tagged 20th century, Cardiff, history, postgraduates, suffrage, women's history. Bookmark the permalink. Was thrilled to read of this amazing rediscovery. 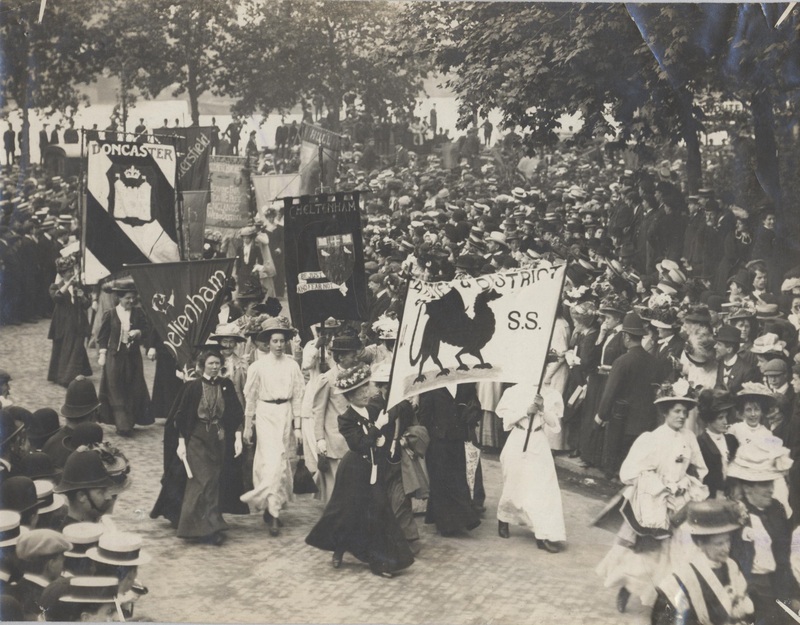 I have updated my (rather long blog on the banners of the 1908 procession – see http://womanandhersphere.com/2014/11/26/suffrage-stories-an-army-of-banners-designed-for-the-nuwss-suffrage-procession-13-june-1908/ – to take account of the new information. Would it be possible for me to include a pic of this ‘new’ banner in the post?